Because there were no art academies in early America, most painters were self-taught. There was no possibility of training in technique and anatomy in America. The early colonial style, based largely on prints of English portraits, tended to be flat, evenly lit, and rich in realistic detail. Naïve portraiture like Phillips’s is characterized by unsophisticated draughtsmanship; awkward rendering of anatomy; flat, even lighting; a hard-edged plasticity; and emphasis on the luxury items of the sitter. Despite the overwhelming influence of European, mostly English, styles in art during the eighteenth and early nineteenth centuries, the tradition of the itinerant, self-trained artist continued. These less-sophisticated artists provided a good source for patronage by less-affluent Americans who nonetheless wanted to demonstrate their refinement and good taste by commissioning art. 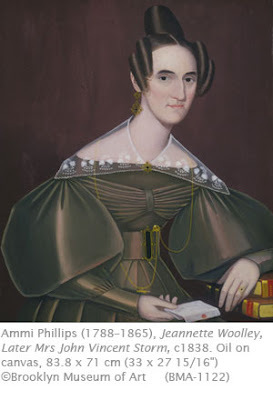 Ammi Phillips painted for more than fifty years, producing perhaps as many as two thousand portraits, although only about 500 are firmly attributed to him. Born in Connecticut, he traveled through that state, Massachusetts, and New York painting portraits. He offered his services as a professional painter as early as 1809 in Pittsfield, MA. In the 1830s he was located in Amenia, NY. Unlike many other itinerant painters who had to resort to other means to supplement their income, Phillips seems to have relied solely on portrait painting as his vocation. His late portraits inevitably show the influence of photography. A century after Phillips died in 1865 he was given his first one-person show, followed by a major retrospective three years later. Today he is considered one of the most prolific and important naïve portraitists in nineteenth-century America. Here you will find an in-depth biography of the artist. Connections Across Curriculum - These early American portraits provide a glimpse into daily life of times past. From the latest fashions to personal values, such as learning history and letter writing as seen in this painting, art from this time can give students an idea of what life might have been like. Students can further explore objects from this time period on the Old Sturbridge Village “What is it?” web page. Based in the same period and location in which Phillips worked, these objects can give students an idea of what the artist would have seen as he traveled throughout the region.